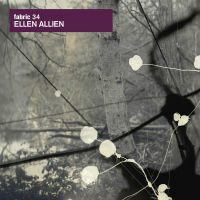 Berlin native & BPitch boss Ellen Allien has been tabbed for the 34th edition of the now famous Fabric series. It’s an interesting marriage when you consider the minimal, edgy, ambient, noisy, and sometimes pop elements that comprise her sound. The end result, as you can imagine, is a multifaceted mix that has something for everyone, but might be a bit too varied for all but the most ardent Ellen Allien fans. The first half of the disc is the highlight here with several standout tracks. The CD starts off with the minimal, clicky, yet groovy sounds of Schubert’s - S1. After that worlds collide with Larry Heard’s minimal meets diva house number The Sun Can't Compare. From there the disc takes several twists and turns, slowly building up the intensity culminating with Melodyboy 2000’s trippy, almost tribal track Sound Stealer. Unfortunately, the second half of Fabric 34 doesn’t quite hold up to the first. This happens for a myriad of reasons. The most glaring of those reasons would be the inclusion of Heartthrob’s Baby Kate & India In Me by Cobblestone Jazz. Don’t get me wrong, on their own these are solid tracks and among the biggest and best of 2006. However, at this point both of them have been played to death, and to have them included on a mix scheduled for a mid 2007 release only relegates them to filler status. Another (albeit minor) gripe is the number of vocal tracks on this mix. Not that the tracks aren’t good, it’s just that for the most part, I prefer my techno vocal free. There are some nice moments here that should be noted. Thom Yorke’s – Harrowdown Hill followed seamlessly by Ellen Allien’s own Just A Woman might very well be this comps high point. Also the disc ends on a pleasing note with Apparat’s melancholy Arcadia. Larry Heard Presents Mr. White - "The Sun Can’t Compare"
Damian Schwartz - "Tu Y Yo (Peros Nos Volvemos A Levantar) (Pilas Remix)"
Don Williams - "Orderly Kaos"
Melody Boy 2000 - "Sound Stealer"
Artificial Latvamaki - "It Is Now Either"
Cobblestone Jazz - "India In Me 2"
Ellen Allien - "Just A Woman"
Heatthrob - "Baby Kate (Plastikman Remix)"